The 'rediscovery' in sixteenth-century Italy of Aristotle's Poetics marks a crucial moment in the development of Western thought about literature, for the flood of new and controversial works that accompanied this event laid the foundations of modern literary criticism and theory. This is a study of the main literary theories of the late Italian Renaissance that seek to define a poetics of dialogue. The author contends that dialogue - among the most popular of all prose forms in Italy to develop a new theory of literature, because it seems to subvert the conventional Renaissance understanding of what is 'literary' and what is not. With its close ties to dialectic and to Platonic philosophy on the one hand, and its equally vital links to imaginative fiction on the other, dialogue in the Renaissance stands at the crossroads of the discourses of cognition and fiction. 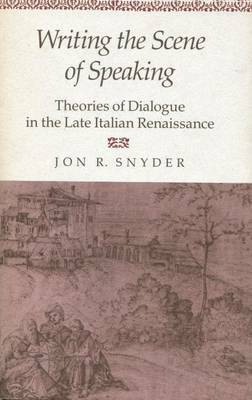 Writing the Scene of Speaking examines the different solutions offered by sixteenth-century Italian theorists to the problem posed by the hybrid textuality of dialogue, and sets them in the context of a culture in a dramatic state of transition. The main body of the book is an analysis of treatises by Torquato Tasso, Sperone Speroni, Lodovico Castelvetro, and Carlo Sigonio. The final chapter looks at the seventeenth-century Baroque literary theories marking the closure of the question of dialogue in early modern Italy.